Computer and video games today entertain many people around the world. Playing games online with real players instead of artificial computer players (like in single player games) has become increasingly important during the last years. Due to ubiquitous Internet access and increasing connection speed, this form of multiplayer gaming has now become available for millions of people. There are various types of online games. Next to ad-hoc or casual games, and extensions of existing single player games, the so called “Massively Multiplayer Online Games” (MMOG) are one of the most widespread forms of online games. These games exist only online. Therein, players are usually part of a huge online world (e.g. in a fictional country or island), which they may build up, extend or explore to a certain degree with their in-game character, the so-called “avatar”. The players have to complete various tasks, such as solve riddles, collect particular items, fight against enemies or reach specific game states. Therefore, such games do not have a defined goal, such as conventional single player games. Instead, the game concept is based on the continuous evolvement of the world and/or the players’ characters. To achieve this goal, collaboration with other players is usually required. Consequently, MMOGs can often be played for an unlimited time, as long as a player is subscribed to the game. According to (MMOGHART, 2008), in 2007 more than 16 million players were active subscribers of a MMOG. “World of Warcraft” (WoW) with 10 million members and “Lineage II” with 1 million members are two of the most played ones. Beyond the entertainment aspect, such games also form specific types of communities, as they unite millions of players. In this respect they could be compared to online communities such as fora or social networking sites (e.g. MySpace, Facebook), as their members also share a common interest through their playing together. Additionally, the members are not only part of the same game, but are also organised in various groups (sub-communities) within it. They interact with players in their own groups and members of other groups. This interaction also comprises of different forms of collaboration and collaborative strategies (Fleming, 2004). With increasing technological progress in the development of mobile devices and the growing availability of mobile Internet, gaming communities are about to get more and more mobile. First approaches to make existing online games also available on mobile devices are already in development (Massively, 2007; Pocketgamer, 2008). Among the reasons for this development is the need of people to take their games with them wherever they are, and thereby the need to accommodate the mobility of these users. The aspect of location independence, which characterises mobile services, is of special importance in this context, because various in-game activities are time-dependent. They require simultaneous actions, e.g. from members of one clan or a member of the same group, or actions at a specific point in time, e.g. taking part in a battle, which may be decisive for the completion of a task. Some other tasks (e.g. management of resources) may also be processed while being en-route, as they are time-consuming but necessary. One gam, that has already taken the step into the mobile world is the strategy game “Travian” (http://www.travian.com/), which is popular in more than 40 countries. Travian is a browser-based strategy game, situated in the ancient Rome. The players are building the city and its army, fight and trade, and communicate with other players to form alliances. Since it is browser-based and does not need any installation of additional software, the game can be played on mobile devices. Regarding commercial aspects, there are, so far, no targeted advertisements and no prize money for winning. However, there is some money flow from players to game developers for virtual gold coins, which speed up actions like the construction of buildings. The users of games like Travian or WoW cannot be easily clustered by specific demographic or socio-cultural characteristics. In fact, there is no typical Travian or WoW player, but a wide range of player types (Yee, 2007). For playing, no real name is required. Instead, players usually use fixed nicknames (which cannot be changed during game). Profile information consists of age, gender, address and optional additional properties. Regarding game play in Travian, the nature of this game conveniently allows one to play at all times, and gives the possibility of temporarily (e.g., few hours, one day, or sometimes even several days) interrupting play at any time. Thus, the group of players in this game consists of students as well as office workers and people with only limited access to Internet (e.g., in the evening only). The players are able to be geographically distributed; the main unifying factor is only the default communication language of the gaming server. In any case, the players are driven by the same shared interest, which leads them to collaborate with each other and to organise themselves in groups. This implies a certain demand for trust, because the progress within the game is often strongly connected to a working collaboration. This collaboration assumes a trustful exchange of information. In order to improve relationships, physical meetings of those who know each other from the game sometimes take place, e.g. due to the fact that they are part of the same group. Levels of trust are not only given by the personal knowledge of the player (pre-established trust), but are also based on the players’ behaviour in the game. The process of building trust in the latter case is usually based on activity in the game forum, and reliability in agreed upon actions (attacks/defences), which lead to more and more trusted players within alliances. A need for deeper trust exists between leaders of an alliance and geographically close members that can actively support each other. Further, there are explicit rules for illegal behaviour in Travian – the so-called “Travian rules” and “Travian ethics”. They are enforced by server-side monitoring daemons, encoded limits on resources, and the possibility to ban players based on evidence provided by other players. In addition, only one account per person is allowed as a protection against a player supporting him or herself using multiple virtual villages. Regarding technical aspects, the players need some degree of continuous Internet connectivity, but even a few days without interaction usually does not harm a player significantly. However, players with frequent access have a competitive advantage, as they can actively react to incoming attacks (by moving their army, or ask for support from other players). The players who are temporarily without connectivity can set up two “assistants” with limited gaming possibilities, but only for 14 days without a login of the original player (i.e., legitimate account owner). As stated before, players in MMOGs are often organised in groups within the game. In some games, especially role playing games, the existence of such groups and participation within them are essential elements of the gameplay. In strategy games like Travian, players usually need to form alliances with other players. They have different types of communication tools, e.g. chat or text/voice messaging. Further, they can use additional external voice chat or similar applications to talk during the game and e.g., to develop strategies or coordinate their behaviour (Nardi and Harris, 2006). Relationships normally start when players meet each other in the game. This may happen by coincidence or due to the fact that they already know each other from real life or even other games (and therefore meet consciously). The relationships, which are built within the game, can be continued and intensified within groups. Moreover, just as real-life relationships are transferred to the game, online relationships are also sometimes transferred to the real-life. For instance, on one hand, according to a recently published study, schoolmates and friends often play together. On the other hand, players who are members of groups sometimes meet each other physically, and thereby extend their relationship to the real world, maybe just to get to know the persons behind the avatars, or even to better coordinate possible future strategies (Nardi and Harris, 2006). Regarding again the example of Travian, the first contact is often made through fights. Communication later follows to either warn an attacking player of consequences, e.g. that the player being attacked is a member of an alliance, or to agree on some type of royalty fee to prevent further attacks. Some players can also exploit the fact that they are stronger to blackmail the weak players (by demanding, e.g., taxes for protection and non-attacking). Complete newcomers, with no previous relations to other players (majority of players). already existing relations from other online games (mainly mature players). prior physical contact from school, work (minority of players). relation to direct neighbours on the map of virtual world (starting as competitors, later neighbours are usually either destroyed or become alliance members). relation to a members within the same alliance. positive or negative relation to a member from another alliances. personal relation after a personal meeting (in real-life). To maintain relationships in some games, players have their own friends list, which works in the same way as friends lists on social network sites. These list all other players who have confirmed their friendship with a player (friends), and inform the player about friends who log on to or who log off from the game. Furthermore, in some cases (e.g. WoW) the list reveals information about the current level and location of friends, or their online activity (Travian) – awareness aspects. Thereby, it is a means for players that allows them to stay in touch with other players and to share information about the game progress of each player. Aspects of trust and privacy are relevant to these forms of interactions, as they are the basis of a trusted collaboration. However, in contrast to other communities, the relationships may be of shorter duration because of more dynamic game play, which might cause players to change memberships of groups, or players who are simply leaving the game. Of course, this is only the case if relationships are not continued outside of the game. In Travian, the underlying platform provides various communication tools. These are message-boards, which allow 1:1 communications with selected players, as well as 1:N communication for all players inside an alliance, and online chat, where everybody is allowed to participate. The platform further provides statistics about game progress, e.g. about ongoing and past attacks, which are visible to all members within an alliance (number of involved soldiers, results, etc.). Travian alows a wide range of different interactions that players may arrange. They are able to manage resources (e.g. soldiers), coordinate and launch attacks, or build alliances. Further, they can exchange relevant information and have the possibility to negotiate or discuss strategies. 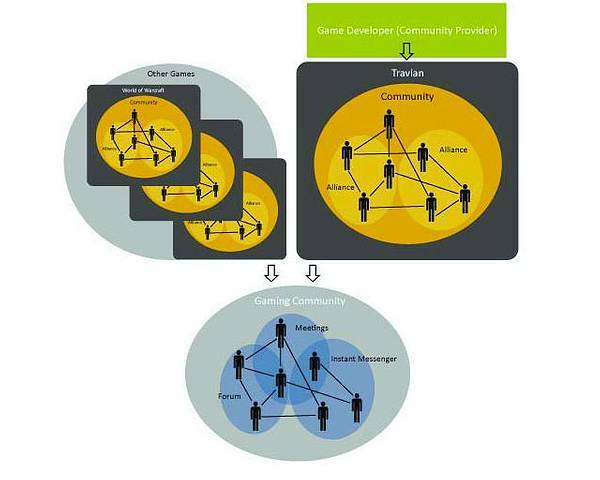 Figure 3: Relationships of gaming communities. Among typical use cases in Travian, the coordination of attacks and defence can be mentioned. The coordination of a new attack involves the exchange of general information to all members of the respective alliance. The details, however, are communicated only between selected members of the alliance. A problem which occurs in this context is the existence of “substitutes” (persons with temporal access to someone else’s account) who are, otherwise, from other alliances, as they can read the messages from internal forums and also from direct 1:1 communications. Unfortunately, this cannot be controlled by the alliance. Defence coordination usually contains the broadcast of support requests to all members of the alliance. One further problem against the background of these typical interactions is so-called spying. In this scenario, a member of alliance A is corrupted by alliance B to provide information about the internal actions of A to B. Such activities are sometimes processed via dead accounts of inactive players. Even though accounts may be deactivated, and further separate message-boards were introduced to limit available information to members of alliances and limit the severe threat of spying, the danger of such actions has not been completely eliminated. Considering the previously mentioned aspects of gaming communities, three main needs can be identified, which should be addressed in the future. At first, stronger interconnectivity between different gaming communities. So far, the players of each online game build their own community, which consists of various sub-communities (clans, guilds, alliances, etc.). But many players do not only play one specific game, and are thus part of more than one such community. Due to this, the need for communication and interaction tools, which allow access to multiple games and thereby let players connect independently of specific games, is probable to increase. Such interconnectivity between gaming communities would also require considering aspects of interconnected trust and reputation. Second, a stronger connection between the on- and off-line worlds. Many players are organized in sub-communities (e.g. clans), who also exist physically in the offline world and, consequently, represent a mechanism to connect people on- and offline. To maintain these relationships, an appropriate infrastructure is needed to allow communication and interaction within these closed groups, even outside of a game like Travian or WoW itself. Third, an increase in the mobility of gaming communities. Considering the mentioned fact that gaming communities will tend to become more mobile in the future, players need seamless access not only to the games itself, but also to the respective supporting community services. In consequence, the players could benefit from PICOS, at first, by the provision of community tools and services that address the identified needs, and which need to be accessible in a mobile context. These services and their underlying platform have to be game and location independent, to support the multiplicity of memberships in a few different games and, at the same time, support the real life dimensions of community structures. Additionally, with all these needs, aspects of trust and aspects regarding the usage and revelation of personal information (Privacy, IdM) have to be considered. However, it should be noted that the previously described aspects may not be valid for all types of online games. As games range from strategy and role-playing, to action and various sports games, the services for the correspondent communities have to be adaptable. Fleming Seay A., Jerome W., Sang Lee K. & Kraut R., ‘Project massive – A study of online gaming communities’, Proceedings of CHI 2004, ACM Publishing, Vienna, Austria, 2004. Nardi B., Harris J., ‘Strangers and friends – collaborative play in World of Warcraft’, CSCW06 Proceedings, Banff, Canada, 2006. Yee N., ‘Motivations of Play in Online Games’, Journal of CyberPsychology and Behavior, Vol. 9, Mary Ann Liebert Inc. Publishing, New Rochelle, USA, 2007, pp. 772-775.